Forget using dainty bottles of smelly hand sanitizer, or making endless trips to the restroom to wash your hands. A new digital solution has emerged for our high-tech times. According to the Institute of Physics, Australian and Chinese scientists have developed a new way of battling bacteria by utilizing a battery-powered, handheld plasma-producing flashlight that can eradicate bacteria on the skin in an instant. 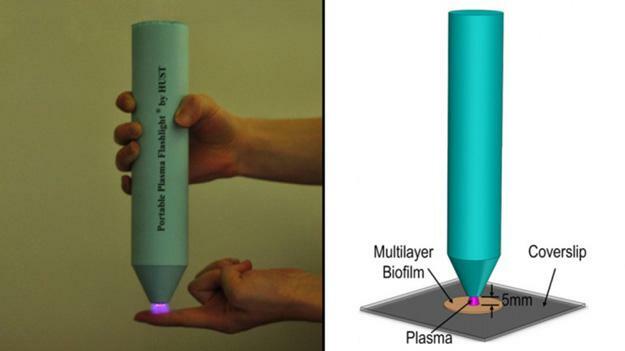 During an experiment conducted by the researchers, which consisted of scientists from Huazhong University of Science and Technology, CSIRO Materials Science and Engineering, The University of Sydney and the City University of Hong Kong, the plasma flashlight proved capable of effectively neutralizing thick biofilms of Enterococcus faecalis – one of the most antibiotic- and heat-resistant bacterium commonly known to infect root canals during dental treatments. By incubating the bacteria for seven days, researchers were able to create 17 different layers of bacteria. After creating the various layers, the team treated each layer with a blast of plasma from the device. After only five minutes, the blast was able to penetrate the bottom layer and inactivate the bacteria altogether. 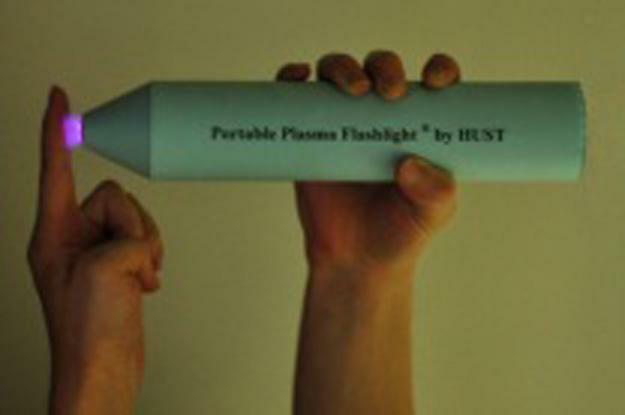 Perhaps even more intriguing than the plasma flashlight is the fact that the scientists themselves don’t seem to understand exactly how it works. Reactions between the plasma and the surrounding air, as well as ultraviolet radiation, has been suggested as possible reasons. While plasma has been previously known to kill bacteria and viruses on the surface of skin and in water, however, the exact mechanism behind it all is still not fully understood. Regardless, the team says the device is safe to use and can be easily manufactured for less than $100. Although they admit that some tweaks and modifications would need to be made to make it more appealing for commercialization. Still, we think the idea of pew-pewing any germs off our hands is pretty amazing, especially if it’s cheap and safe. So long, Purell.